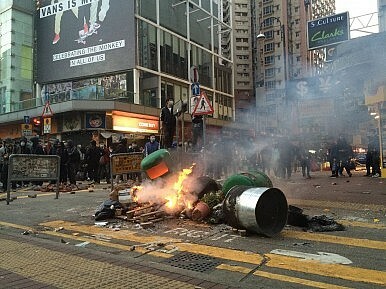 Support for street food vendors in Mong Kok turned into a violent clash between protesters and police. What started as a protest against a ban on street food vendors in Hong Kong turned violent overnight, with scenes on social media showing protesters clashing with police and setting fires in the streets. All told, 80 police officers and four journalists were injured, according to Hong Kong’s chief executive, and 54 arrests have already been made. Protests began Monday night in Mong Kok, then turned sour early Tuesday morning, as police used riot gear and pepper spray and protesters threw objects at police lines. At around 2 am, one police officer drew his gun and fired warning shots into the air – which elicits an audible roar of anger from the crowd in this video from Hong Kong Free Press’ Kris Cheng. The use of gunfire sparked further protests (and further violence), which lasted into Tuesday morning. Hong Kong Chief Executive CY Leung labeled the incident a riot in a televised statement, describing scenes of arson and attacks on police officers. “I believe the public can see for themselves, from TV news reports, the seriousness of the situation,” Leung said. “When our lives or others’ lives are being threatened, we are allowed to use firearms,” he said on Tuesday. However, he added that it was too early to determine “whether the decision was correct,” saying a further investigation was necessary. The protests were ostensibly against new attempts from the Food and Environmental Hygiene Department to prevent street vendors from setting up their stalls on the Lunar New Year holiday. The group Hong Kong Indigenous sent out a call asking people to support the hawkers; police were called in to respond, and the stage was set for the violence. The role of Hong Kong Indigenous – a localist group that has also orchestrated protests against mainland traders – in the protests means the incident was tapping into a collective anger over far more than street food vendors. Localists groups are marked by a strong distrust of both mainland China and their own government – sentiments that were on mass display during the 2014 “Occupy” protests calling for full democracy in the Special Administrative Region. The piece also warns that the violence of the police and the “hopelessness” of protestors will only escalate in the future. “We have reached the point of no return,” it concluded. The scene in Mong Kok was mostly quiet on Tuesday evening for the annual Lunar New Year fireworks, although there was an increased police presence in the area.